Your choice. As long as the meat stays juicy, moist and delicious, you can call it whatever you want. 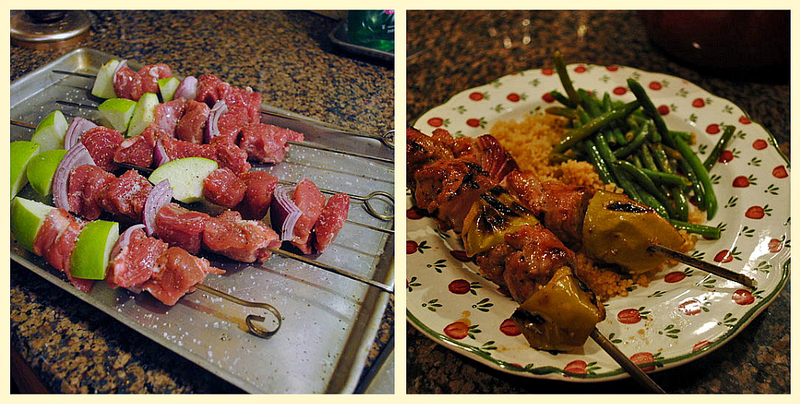 I like kebabs myself, and these were a big hit last week, probably our favorite dinner. Lightning-fast to prepare, especially if you do what I did, and assemble the skewers early in the day, saving them in the fridge until dinnertime. Just sprinkle a little lemon juice over the cut apples to prevent them from darkening too much, and cover with plastic wrap. If using wooden skewers, soak them in water for several hours. Assemble long skewers alternating pieces of pork, onion, and apple wedges. Start with t a piece of meat, and end with a piece of apple. Reserve. (This step can be made several hours ahead of grilling). In a small bowl, combine the apricot jam, vinegar, tomato paste, and 1 Tsp olive oil. Season with salt and pepper. Heat grill to medium-high, and oil the grates. Sprinkle the kebabs lightly with salt and black pepper. Place skewers on grill; cover grill, and cook, turning occasionally, until grill marks are visible, about 8 minutes. 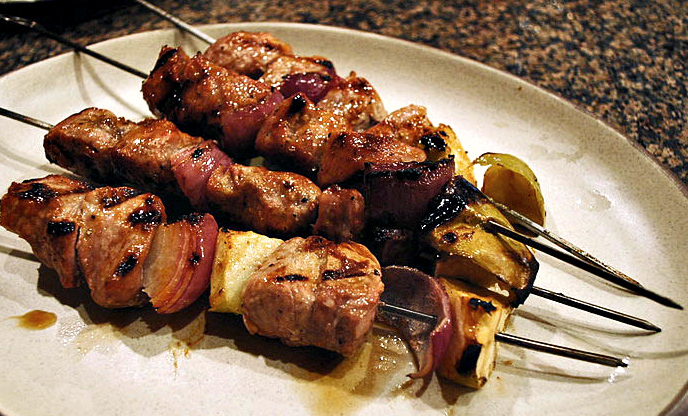 Brush the kebabs with some sauce, and cook, turning skewers and basting occasionally with more sauce, until pork is no longer pink in the center and is nicely glazed, 6 to 8 minutes more. Serve over steamed rice, couscous, or just with a salad. My only modification of the recipe was to skip the step of peeling the apples. I hate peeling apples because I lose about 63% of the fruit in the process. Anyway, not a good move. I thought that the peel would help the apple keep its shape and would not interfere with the taste, but it just doesn’t work this way. Do as Martha does, peel your apples! These kebabs are absolutely great, we gave them two thumbs way up… Since grilling takes less than 15 minutes, pick side dishes that cook quickly too. I went with couscous – cannot beat that – and simply sauteed green beans. Leftovers were still moist and tender next day, I warmed them briefly in the microwave and squeezed a little lemon juice when they were ready to be enjoyed. The apricot glaze is a keeper, for pork, chicken, shrimp… endless possibilities. TWO YEARS AGO: Got Spinach? Have a salad! I don’t think you can go wrong when using a pork tenderloin. The name itself tells you it will be tender! I love the flavor combinations in the marinade. I’m with you on peeling the apples, possibly I may just skewer them separately or as a sauted side dish. Either way, this is definitely going to be a recipe I will make! Sally: telepathy! I just made Italian kebabs (“spiedini”) last week-end for our kids camping trip. Mine had bread alternating with meat to mop up the juices… I like your addition of apple: never seen that before! Oh, I LOVE the idea of cubes of bread! GENIUS! this will go into my next projects for sure…. thank you! I really want to call these kebaps, so I will not be overcooking them. Seriously, they look great. I love easy to throw together food that tastes great. Thanks Sally. These look so good Sally – your kaboobs (sorry, couldn’t resist introducing another variation, so childish :)) are glistening in that first photo!! I agree with the unpeeled apples. Too much work and too many nutrients lost when they are peeled. Apricot jam; mmm…..
At first I thought, a kebab recipe… but then I saw the words apple and apricot… this is a dish I would love! Apples and apricots…. cannot beat that combo! add the sugar in the jam, and I am ready! Pork and apples are such a wonderful combination. I love the idea of the kebabs. They look so good, causing me a major crave!